I don’t like this squirrel’s attitude. 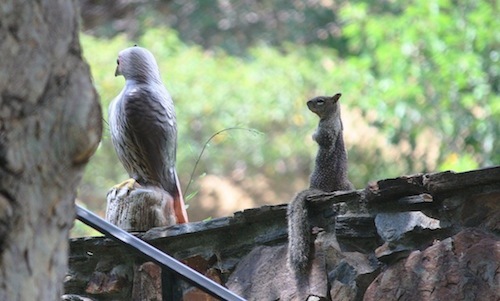 After investing money is a plastic hawk, it still wasn’t enough to scare off this mangy, rat-faced, no-good, low-life, beady-eyed, scum-sucking, apple-stealing squirrel. I placed the hawk there couple of weeks ago and apparently, it’s just an inconvenience. Now instead of running along the stone wall, the furry rodents have to detour around the bird and scale down the side to get to my apples. Who needs fireworks when they have this in their backyard? I was so lucky to get this shot! I saw the mom and baby walk by and went out with my camera (like I always do when anything moves back there) and I started taking pictures. 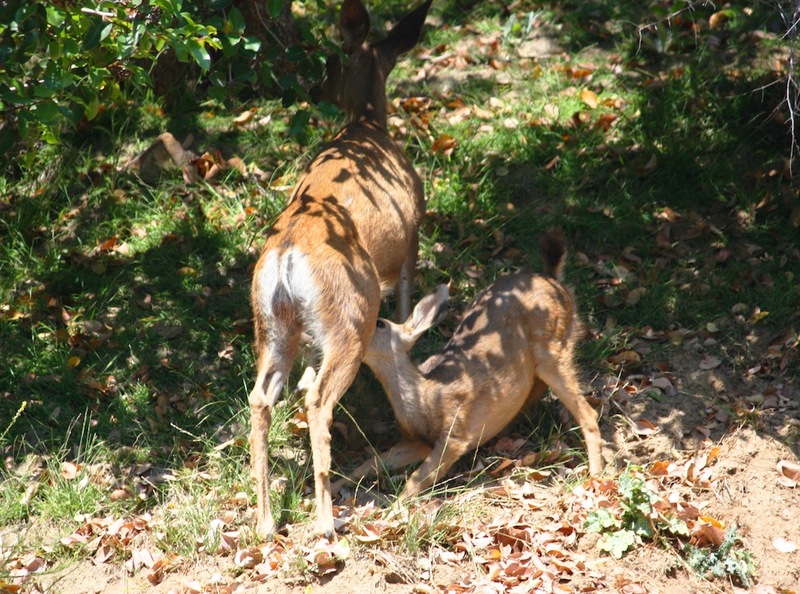 Then the baby saw me and took off but the mom stayed, probably because she’s more used to seeing me. I was about to go back in the house, assuming the mom would follow the baby but then I saw the baby walking back to the mom. I still didn’t know what was coming. I was just prepared to take some photos of them together. And then THIS happened! Wow! It was lunch time, baby! I was so excited to be a spectator at this beautiful event, I could hardly hold the camera still. What a joy that they came to our house today. Tomorrow’s 4th of July fireworks will never compare. 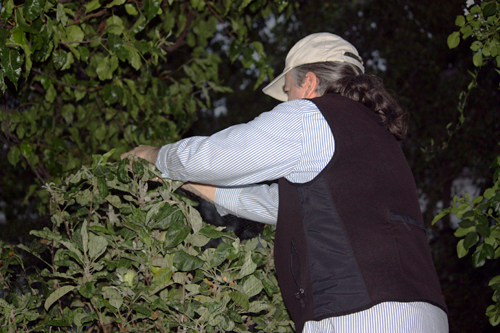 Thanks to the mangy, rat-faced, no-good, low-life, beady-eyed, scum-sucking, apple-stealing squirrel, I was forced to cover my entire apple tree with netting if I ever hoped to make my apple pie bars with my own apples. The tree is about six feet tall and we covered it 2 weeks ago. It’s been keeping the rodents and the birds away but yesterday, I kept hearing a noise inside the netting that sounded like a bee. No problem. But the sound became louder and it couldn’t be a bee, especially at dusk. 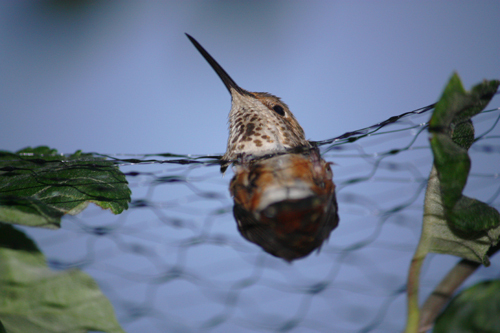 Denis and I went to look and it was a hummingbird! 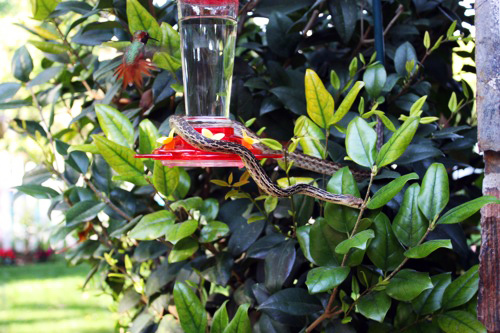 He must have flown through a small opening and now was trying desperately to get out. 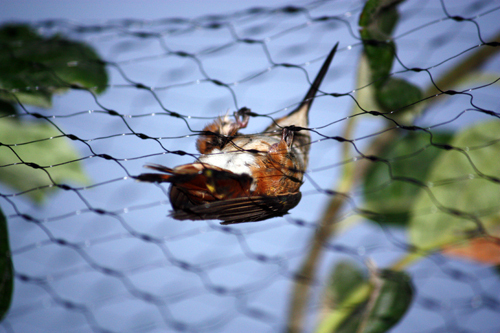 He would fly wildly around (there isn’t much room inside with all the leaves and branches), grab onto the net to rest, and then fly again. The opening must have been near the bottom but he kept trying to get out at the top or sides. At one point, he was able to stick his face out at the top and I thought he’d be small enough to poke through, but couldn’t. So Denis and I went to work. I cut a big opening in the netting at the side where there weren’t as many leaves and Denis tried to guide him to the opening, but he wouldn’t come over. It was starting to get dark and we had to try something else. 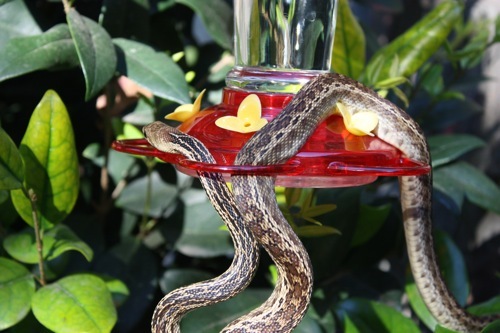 By now the scared little bird saw the top as his only escape. So Denis went and got a ladder to reach the top of the tree and cut a hole in the top. I checked on my pomegranate tree a couple of weeks ago and the fruit never looked like it was ready. Denis said not to worry because the squirrels were all hibernating and the fruit would be safe. And I know the longer any fruit stays on the tree, the sweeter it will taste. 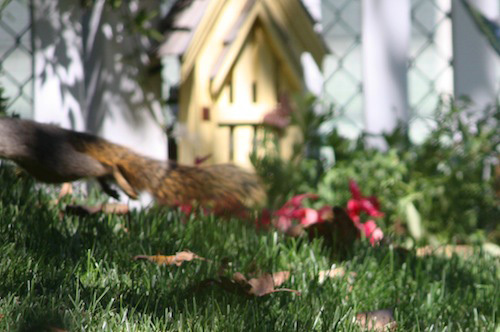 But this morning, I saw a squirrel in the back yard. Hmmm… not hibernating… not carrying nuts… so what’s that in his mouth?? It’s big and red and it’s not Santa Claus. That mangy, rat-faced, no-good, low-life, beady-eyed, scum-sucking, pomegranate-eating squirrel is ruining my life. I threw a tennis ball at him and missed but it got his attention. He dropped the pomegranate (what was left of it) and flew like a reindeer up the back hill and he was gone. 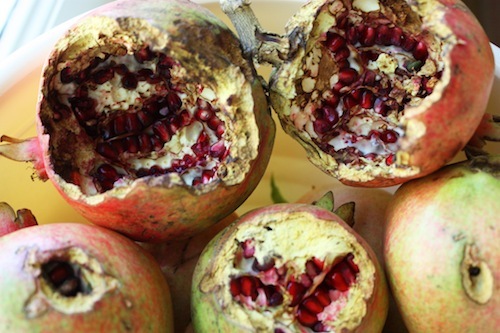 I decided I’d better take all the pomegranates off the tree so that rodent can’t get any more. See this picture? The one on the lower right was the one he dropped and it was just a shell with nothing left inside. The other ones were still on the tree! I planted this tree because pomegranates are super healthy and eating them will make you live longer. So my mangy, rat-faced, no-good, low-life, beady-eyed, scum-sucking squirrel is probably going to live even longer than he normally would, thanks to me. Life is not fair. Is he looking at me or not? 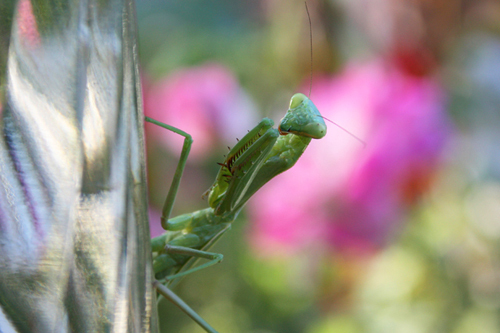 This praying mantis was hanging out on the side of a hummingbird feeder all day. When I got close, he kept tilting his head around and I never knew when he was looking at me. See those little black dots inside the big green orbs on the corners of his head? I think they were moving around. So we had a staring contest. But I don’t know who won because I don’t know if he was really looking. But he was still there when I left so I guess he won. Oh, this guy showed up, too. It was not nearly as much fun taking his picture and I promise I did not get as close. It was a zoom lens! 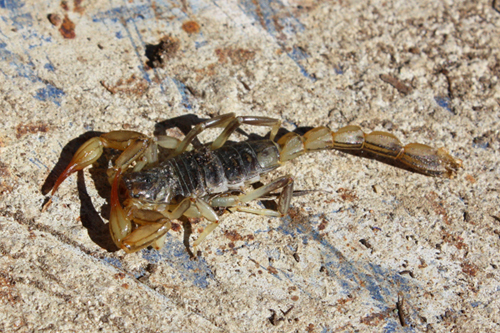 This was our 4th scorpion since living here in the southern California hills. At least it’s the 4th one we’ve seen. I’m pretty sure there are more out there. It was scary. I need taller boots. And bigger cojones. Have you seen the pictures I posted of my beautiful home? It’s paradise. The day I saw it for the first time, seven years ago, I knew in less than five minutes that this was my dream home. It has the most beautiful backyard and beyond it is a huge hill that wraps around the yard. For someone like me who enjoys nature and the outdoors, it’s truly a dream place to live. I remember the first time I saw a deer on the back hill, of course I grabbed my camera and have been taking deer pictures ever since. And when I saw my first coyote, I was a little anxious but still excited. Then came the bobcat…. okay, I kept my distance. 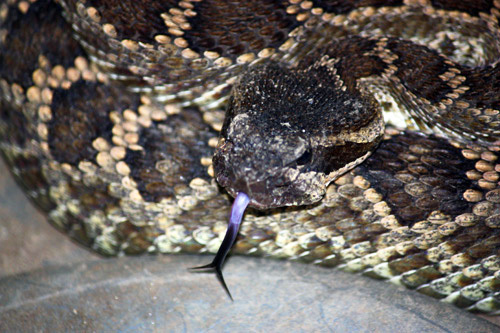 The first time I saw a rattlesnake, it was a shock but I knew they existed in Southern California. I just didn’t expect to see them every year. They come out in the morning to warm up on concrete or stone and we have a stone walkway so I stay away in the morning hours. Now this year, the skunks showed up. Yes, that’s plural. A family of skunks has been coming around, in fact last night I was outside after dinner and a skunk walked right past me! If my back had been turned I might not have seen him and could have walked right into him. And then what? 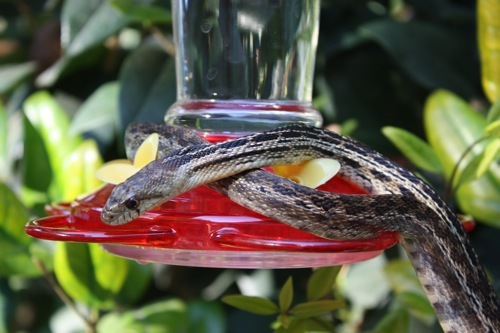 So I avoid going outside in the mornings for snakes, and in the early evening for skunks. But I do have a window of freedom from late morning into the afternoon (the hottest part of the day). Beyond that I’m a prisoner in paradise. I regret it had to come to this. 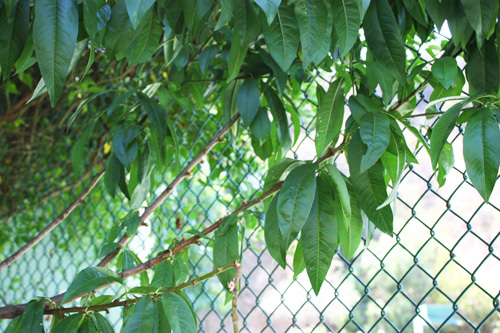 But here are the harsh details: I planted a white peach tree because white peaches are a delicacy and these were going to be organic, too. My tree was getting bigger and this year, it produced more peaches than ever. 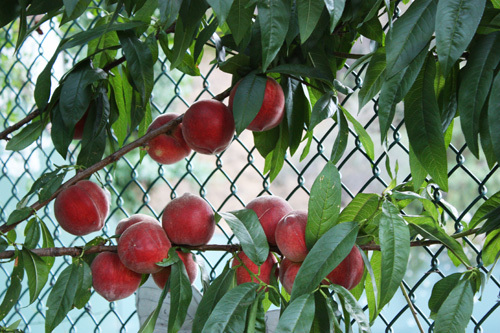 I was so excited to see all the blossoms in the spring and could hardly wait to pick my first peach. Imagine my dismay when the peaches finally came and I would walk out to see 5 or 10 peaches on the ground every day, most of them with just as bite taken out, and they were still hard and nowhere near ready to pick. But they were ready enough for the squirrels. One day in particular, there were 24 unripe, damaged peaches on the ground. So of the 200 or so produced by the tree, we got to eat five. The other ones that I was forced to pick early finally softened but they weren’t sweet. And the ones I held out for until they were a bit soft, mostly had bruises and brown spots anyway. I can’t say I didn’t try. I used a hot pepper spray, stuffed beach balls into the tree, tied dangling CDs from the branches, traps, plastic hawks, and a rubber snake. Nothing worked. And the tree became a source of stress and anxiety of what was coming next year. So it’s gone. The gardener dug it up today. Watching him carry it away was sad. You win, you mangy, rat-faced, no-good, low-life, beady-eyed, scum-sucking, peach-eating squirrel. 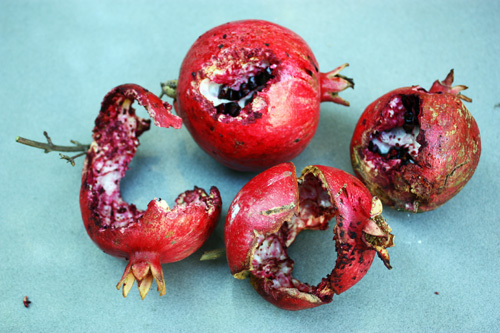 But don’t be a stranger… my pomegranates are coming next. I love to bake. And I love peach pie. So it’s a natural that I would make an awesome peach pie from the juicy peaches on my tree. I have fought off the mangy, rat-faced, no-good, low-life, beady-eyed, scum-sucking, peach-eating squirrel for weeks with my plastic snake, putting beach balls in the tree, tying cd’s to the branches to spin in the wind, I put my plastic hawk next to the tree, and a trap underneath with peach bait inside. All for nothing. The squirrel never gave up, finding new and inventive ways to steal my peaches. Even though he had already taken most of the fruit off my tree, I was happy to get what I could. I managed to pick a few last week but it was too early and they weren’t sweet at all. So I decided to wait, watching them every day, squeezing to see if they were ready, happy that the squirrel was leaving some good ones for me. In fact there were a couple of branches with rows of peaches… just enough for my pie. WHAT!?! It can’t be! They were all here yesterday. 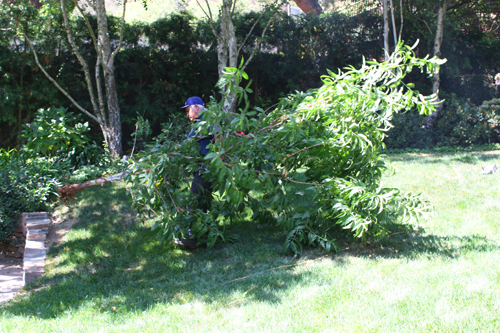 I thought I had the wrong branch and pulled down the other branches – nothing. Every single peach was gone, even the other ones down below. There’s no way one squirrel could eat that much in one day. What did he do? Sound a battle horn to call every squirrel in the neighborhood to come to my house? 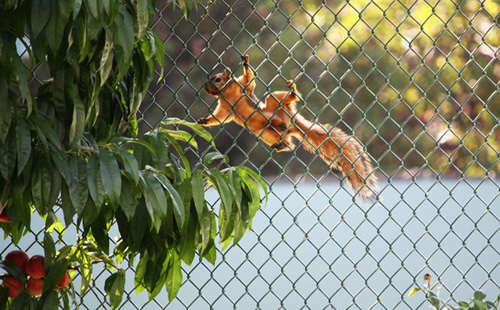 “Hey, squirrel homies! The peaches are ready now! Let’s move!” Somebody give me a shovel. I’m digging up the tree. If I can’t have it, nobody else will either. I suppose it will leave a big hole in the ground and that could be a hazard. Gee, I hope nothing falls into the hole. What if he couldn’t get out? What if a net accidentally fell on top of him? Yes, I need a shovel… and some champagne.